Davis-Besse is getting a brand new reactor vessel head this fall — its third since 2002. And we’re going to invest more than 400 inspection hours to make sure the replacement is done right, and safely, for the workers and the public. New reactor heads have been installed at 36 out of 69 pressurized water reactors in the U.S. This head replacement, however, is a major milestone because of the history at Davis-Besse. This is the location where, in 2002, a football-sized cavity was discovered in the reactor vessel head. Because of corrosion found on the head, only a thin stainless steel liner remained between the reactor and the containment building. The NRC responded to this event by completely overhauling its regulations to require more rigorous examinations of reactor vessel heads. The damaged head was replaced with a similar head manufactured for another plant that never started operating. It went into service in 2004, after the NRC allowed Davis-Besse to restart. However, the first replacement head developed several small cracks in an unexpectedly short period of time. The cracks were discovered during NRC-required inspections in 2010. Unlike the degradation found in 2002, these cracks did not challenge the overall integrity of the head and demonstrated that the NRC’s new inspection program worked to identify cracks before they could result in significant head degradation or leakage. The cracks in the replacement head were repaired. But the NRC and the plant’s owner, FirstEnergy, had extensive discussions about how long the repaired head could remain in service given the uncertainties associated with the unexpected cracking. 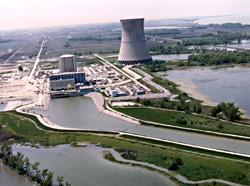 As a result, FirstEnergy decided to replace the reactor vessel head in October 2011. This brings us to this brand new reactor vessel head manufactured in France from an alloy that is much less susceptible to corrosion than the two previous heads. The process to install this new head began this week after the reactor shut down on October 1. The NRC will be there every step of the way. In fact, our reviews started in July, when we began out inspections to verify that the new reactor vessel head was made in accordance with our standards and requirements. NRC resident inspectors at the plant and specialists in metallurgy, health physics, security, and other areas from the NRC Region III Office in Lisle, Ill., are reviewing calculations, procedures and work plans and will directly observe the most significant activities associated with head replacement and post-installation testing. The results of these inspection activities will be documented in the Resident Inspector Quarterly Inspection Report. Tomorrow, I’ll outline describe how the 180-ton head is actually replaced – no small feat – and how the NRC will conduct its inspections. The head that is being installed is brand new, unlike the first replacement head which had been manufactured for a plant that never went into operation. This head was in storage for a number of years before going into service at Davis-Besse in 2004. The new head and its nozzles are made from material that is known to be far more resistant to corrosion and cracking that affected the previous reactor vessel heads . NRC inspectors have reviewed the manufacturing records for the new head to make sure it was made in accordance with requirements. As it is a brand new head it does not have any corrosion. Further, when the new head is installed, it will be tested for leakage before the plant returns to service. Finally, the new reactor vessel head will be subject to the stringent inspection requirements for reactor vessel heads that went into effect following the discovery of the cavity in the reactor vessel head in 2002. This new inspection regime demonstrated is effectiveness when minor cracks were identified in the replacement reactor vessel head in 2010 long before they could cause a safety concern. Ultimately, this discovery led to the expedited installation of the brand new head which is currently taking place. From what I know of Davis-Besse, the reactor vessel head is only the tip of the iceberg. This piece of garbage should have been shut down permanently back in 2002 for all the stuff found and documented in the System Health Readiness Reviews (SHRR) and Latent Issue Reviews (LIR) completed by the system engineers during the two-year enforced shutdown. A good number of the issues documented on Condition Reports about deficiencies found on the plant’s primary safety systems were stuck in the plant’s Corrective Action Program, and to this day are probably still there – tracked and binned, but no action taken. There was an extreme amount of pressure from the upper management to get the plant back on line, because, “Davis-Besse was not going to be the black hole of FirstEnergy”. I should know. I was one of the system engineers that wasted my time working at that plant for nearly four years. How do you know that the replacement head that was manufactured in France will react any differently than the previous heads? Was it tested for corrosion? Was it tested under pressure for cracks? I think the only way to test them is by installing them in a reactor and this is putting the public in danger. What if it fails? Previous Previous post: Federal Employee Viewpoint Survey Results – NRC’s ranks #1!